Coffee country – South Sudan. Home of Nespresso’s premium producers. Coffee pods are one of the social and marketing phenomena of our times. The dominant brand Nespresso continues to commission the matinee, or should that be mid-morning?, idol George Clooney to promote its coffee to a prodigious band of consumers who cannot, incidentally, all be women. 10 years on, and owners of the brand Nestlé have issued a new advert featuring the film star and advocate of green causes. On the first point, a Nespresso spokeswoman conceded that the public still needed to be educated, quoted in the Marketing Week (September 25th 2016) article “Nespresso: Consumers are ‘misinformed’ on recycling“. The company’s pods are made from aluminium, and therefore are capable of being endlessly reused. There are collection points, and the company will even pick them up from the home. Other producers offer a similar service, but it does require some action, and planning, on the part of the consumer. One estimate is that only 5% of coffee pods are recycled. Last week (October 5, 2016) Nespresso announced the launch of its new premium brand, SULUJA ti South Sudan, in five countries. Until now the coffee has only been available in France. I spoke on the telephone to Yvonne Iwaniuk, Global Corporate Communications and PR Head, from Nespresso, and Paul Stewart, Global Coffee Director at TechnoServe, its non-profit partner, which began working in 2011 to revive this coffee, which grows naturally in South Sudan, almost wiped out during years of conflict in the region. Yvonne Iwaniuk opened by correcting a story from the Wall Street Journal, already repeated elsewhere, that ongoing conflict in South Sudan had stopped production of the new coffee there. This was not true, she said. Coffee production was continuing. However the security situation had meant the team training the producers could now not safely travel around the area. Training was continuing through regular radio broadcasts. Nespresso and TechnoServe have worked with 700 farmers, imparting coffee-farming skills and building production infrastructure. Previously the farmers sold small amounts of average or inferior coffee. Now their prospects have been transformed. The revived SULUJA ti South Sudan (it means means ‘Beginning of South Sudan’ in the indigenous language Kakwa), is a “rare and special” coffee robusta, which commands a premium price. The farmers make a living from their work, and produce enough food to sustain themselves and their families, Paul Stewart told me. 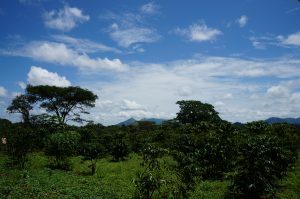 He said there was plenty of land on which coffee production could be expanded. United States Agency for International Development (USAID) says it will work with Nespresso and TechnoServe to invest $3.18 million over the next three years in the project. The aim of the investment is to help South Sudan to diversify its export market away from its reliance on oil and raise the household incomes of smallholder coffee farmers. The coffee is harvested between October and January, and then processed in the growers’ own dryers. In many cases it is the farmers’ only source of cash income. Yvonne Iwaniuk described this new coffee market as a “win-win for the producers and for consumers”.